It’s a lovely question. Before reading on, have a go at it – or at least have a think about what approach you’d take – as I’m going to discuss a couple of methods and I’d be interested to know how everyone else approached it. 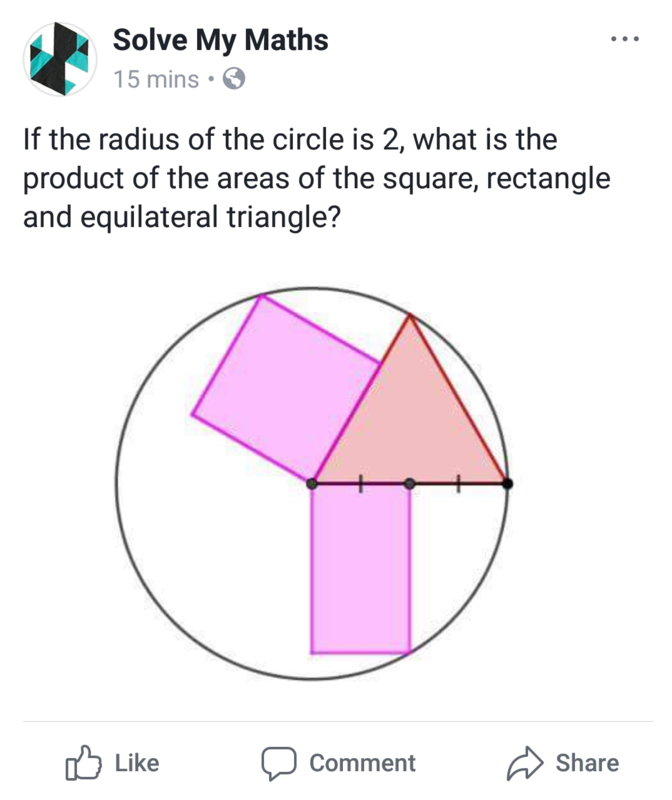 I looked at this problem and saw right angled triangles with the hypotenuse root 52. I knew the gradient of the radii must be -2/3 as each radius met a tangent of radius gradient 3/2. 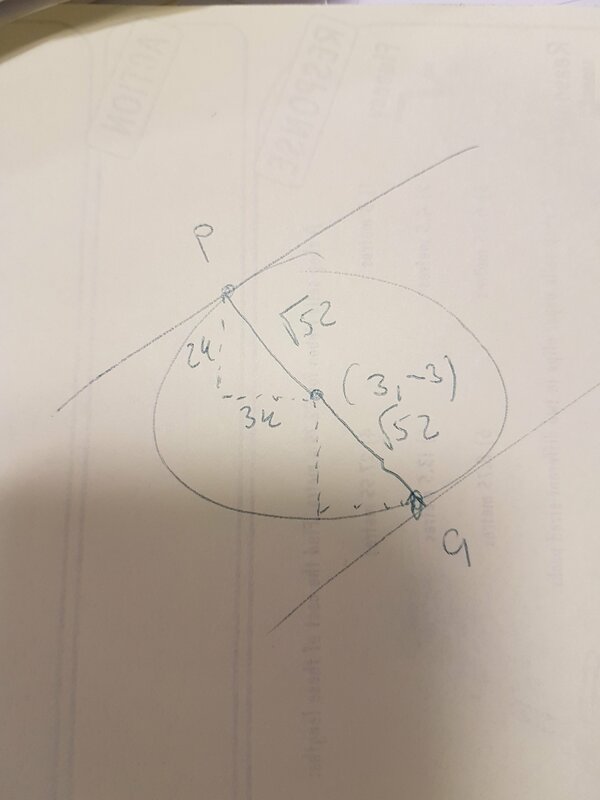 From there it followed logically that the ratio of vertical side : horizontal side is 2 : 3. Using this I could call the vertical side 2k and the horizontal side 3k. Pythagoras’s Theorem then gives 13k^2 = 52, which leads to k^2 is 4 and then k is 2 (or -2). So the magnitude of the vertical side is 4 and of the horizontal side is 6. From here it follows nicely that p is (-3,1) and q is (9, -7). Finally there was just the case working out the equation given a gradient and a point. 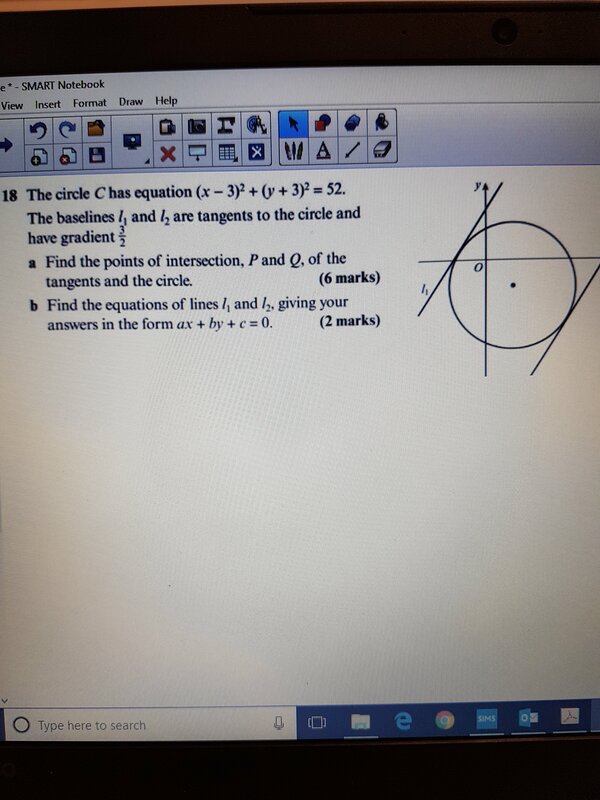 I thought this was a lovely solution, but it seemed like a rather small amount of work for an 8 mark question. This made me wonder what the marks would be for, and then it occurred to me that perhaps this wasn’t the method the question writer had planned. Perhaps they had anticipated a more algebraic approach. 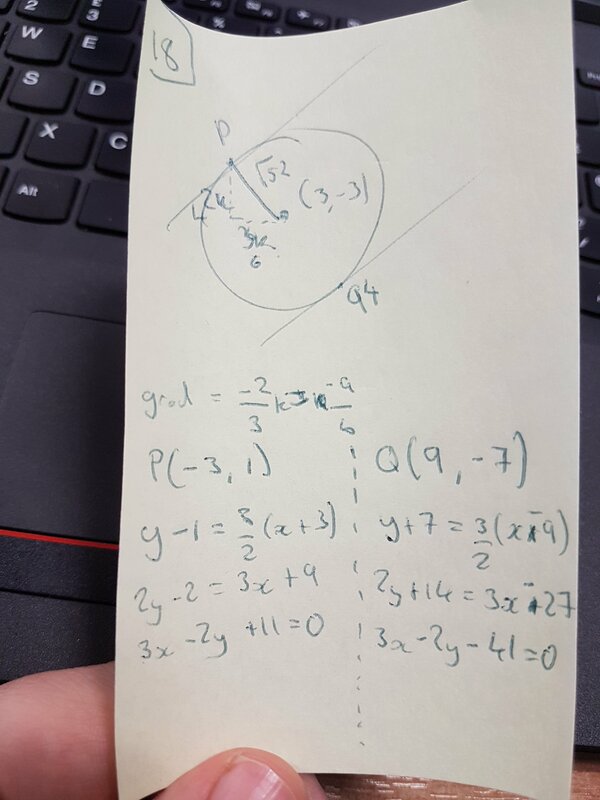 I had the equation of a circle: (x – 3)^2 + (y + 3)^2 = 52. 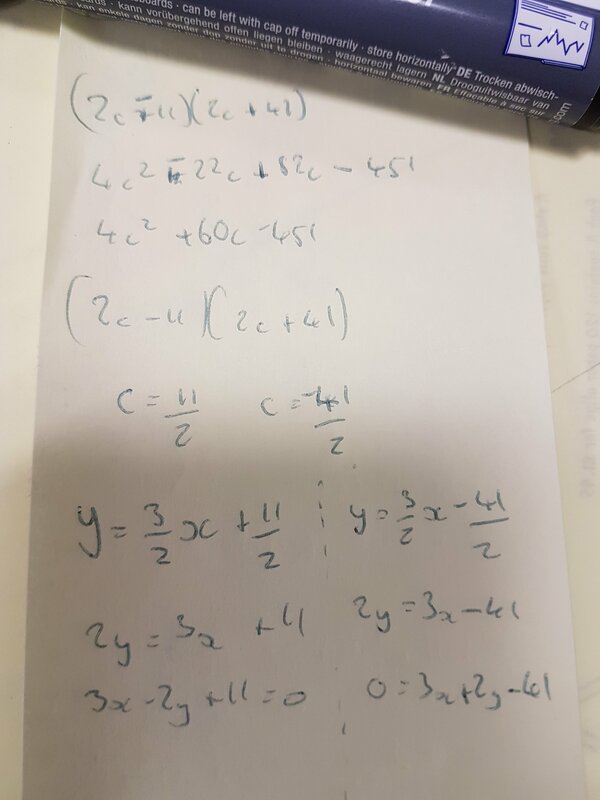 I also knew that each tangent had the equation y = (3/2)x + c. It follows that if I solve these simultaneously I will end up with a quadratic that has coefficients and constants in terms of c. As the lines are tangents, I need the solution to be equal roots, so by setting the discriminant equal to zero I should get a quadratic in c which will solve to give me my 2 y intercepts. Here are the photos of my workings. 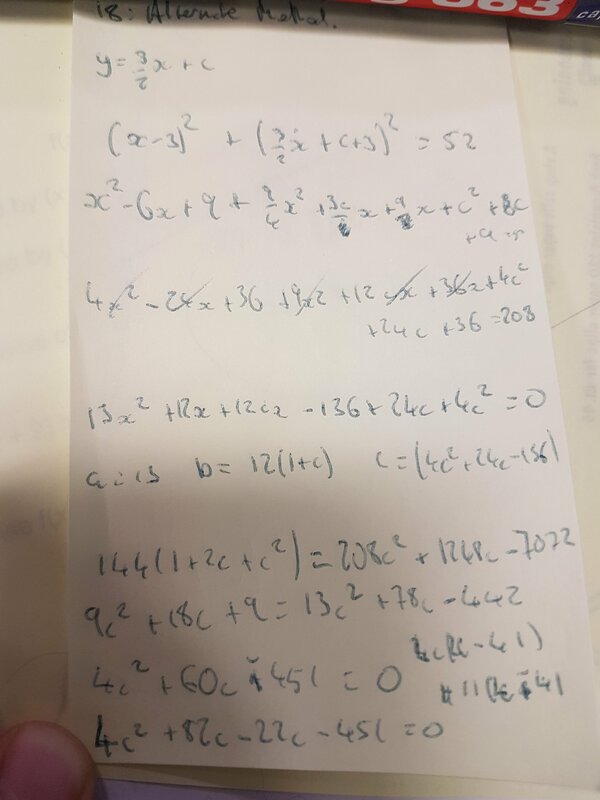 As you can see, this leads to the same answer, but took a lot more work. I’d love to know how you, or your students, would tackle this problem. A couple of nice parallel lines questions that I might grow at y11 tomorrow. 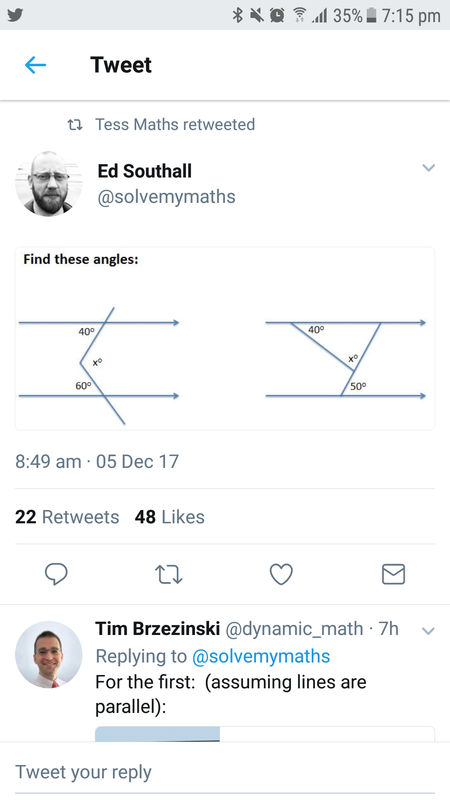 Both are fairly straight forward to solve. 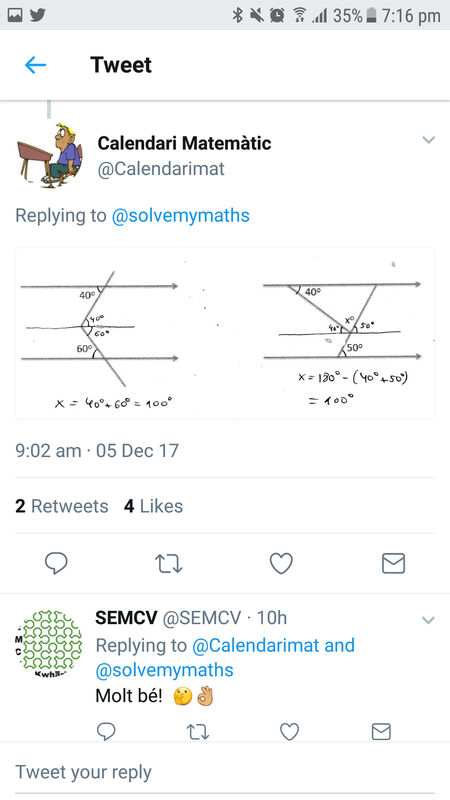 I looked at the first one, imagines a third parallel line through the join if x and saw x must be the sum of 40 and 60 hence 100. The same thought process for the first one, but a significantly different approach to the second. It made me wonder what approach others would take, and which approach my students would take. I wondered if the first problem had led this respondent into this solutions the second, and if so why it hasn’t had the same effect as me. I don’t know if either approach is better, I just thought the differences were interesting. I’d love to hear your thoughts on it and how you would approach it.